September 8, 2018: Leading online crypto news portal TheCurrencyAnalytics is pleased to announce its recent partnership with new revolutionary crypto platform Enkronos. Both the parties have signed an agreement for mutual investment worth $300,000. As part of the alliance, TheCurrencyAnalytics will be investing in Enkronos ENK token and Enkronos will be investing in TheCurrencyAnalytics’ TCAT. “We are excited to partner with TheCurrencyAnalytics and its revolutionary token TCAT. We believe in TCAT’s mission to deliver only the most authentic news penned by morally upright professional journalists. We realize it’s the need of the hour to get access to ‘real’ and ‘ethical’ news reports in today’s superficial world to develop informed decisions regarding crypto investments and the market. We are looking forward to a long term liaison with TheCurrencyAnalytics”, stated Gianluca Busato, the chief spokesperson from Enkronos. Enkronos is a digital strategy company which has recently released its crypto portal through the launch of Enkronos Apps. It represents a fully trusted blockchain credit system for ethical data driven campaigns. Enkronos has already raised its soft cap and its ICO will start on September 18, 2018. Enkronos Apps extend an exclusive data-driven multi-application portal for marketing, advertising, Artificial Intelligence as well as Big Data solutions. Enkronos aspires to address the increasing problem of unethical conduct in these fields through its newly launched blockchain-based Enkronos Apps. Any usage of Enkronos Apps is only viable with ENK tokens that can be registered and traced in a secured way. 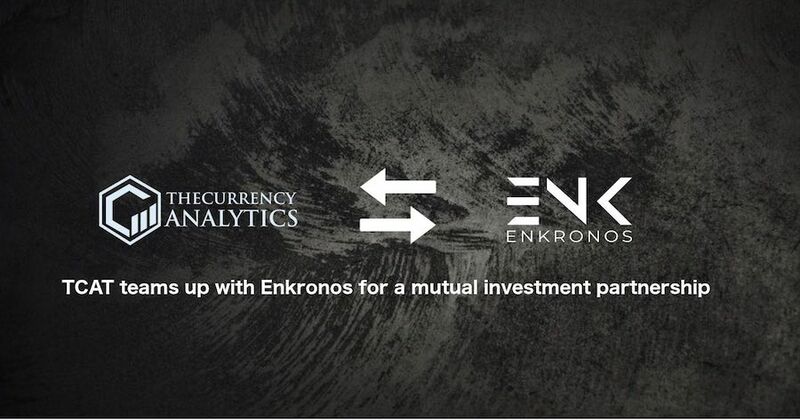 “It’s a great moment for us to invest and tie-up with Enkronos & Enkronos Apps. Akin to us, they too are striving to establish ethical standards in the industry and that too in regards to various applications. We are positive Enkronos will be able to ensure ethical way of conduct through its blockchain platform and we are excited to invest in the breakthrough ENK token”, noted Sydney Ifergan, the founder of TheCurrencyAnalytics. For more information, please visit thecurrencyanalytics.com , enkronos.com and ico.enkronos.com.